I don’t ask for much in a bank. Basically, I want my money to be safe, and I’d prefer not to have to pay exorbitant monthly fees to access my cash. It’d also be helpful if I could get some cash back or earn more interest than a mere $0.02 per statement (or less). You’d think that what I’m asking for would be commonplace, but the big banks’ towering skyscrapers and 7 and 8 figure executive salaries don’t pay themselves. As a result, they squeeze their account holders for every last dime, and they make it seem like they’re doing us a favor by holding onto our cash for us. I realized not long ago that if I wanted fair treatment, I had to ditch the brick and mortar banking establishments and look elsewhere. Online banks are the way to go, but I kissed a few frogs before I opened an account with Discover. And now, I won’t bank anywhere else. Despite what is about to be an overall glowing review, Discover Bank is not without its flaws. So, I’ll be honest, and in this review, I’ll tell you where I think they’re doing an excellent job for their customers, and where they could use some improvement. Is Discover Bank Federally Insured? What I appreciate most about Discover is that I know my money is safe with them. In the early 2000s, a lot of suspicious-looking banks opened their virtual doors, and the Internet was a Wild, Wild West of scammers and Nigerian princes. Since Discover is an established institution with a history of serving credit card customers since 1985, there’s a sense of security when you store your money with them. If you are wondering what bank owns Discover, it’s Discover Financial Services, Inc. This is the same for many card companies. For example, the “real” AmEx cards are backed by American Express Centurion Bank. While they are relative newcomers to the banking industry, you can rest assured that your funds are FDIC-insured up to the maximum allowed by law, which at the time of this publication is $250,000. But, before you get too excited about the security of your money, FDIC insurance (Federal Deposit Insurance Corporation) only kicks in if the bank goes under. It’s most relevant during extreme financial crises like The Great Depression and the 2008 Financial Crisis. In 2008, 25 banks failed. However, it doesn’t apply to theft or hackers. Knowing that Discover Bank isn’t likely to fail, the biggest concern in my mind is what happens if there’s a security breach and hackers steal my money. This isn’t just me being paranoid, either. Hacking and digital theft are on the rise, and many major corporations have had their customers’ information compromised. Fortunately, Discover Bank has private insurance if unscrupulous computer thieves steal your information and cash. 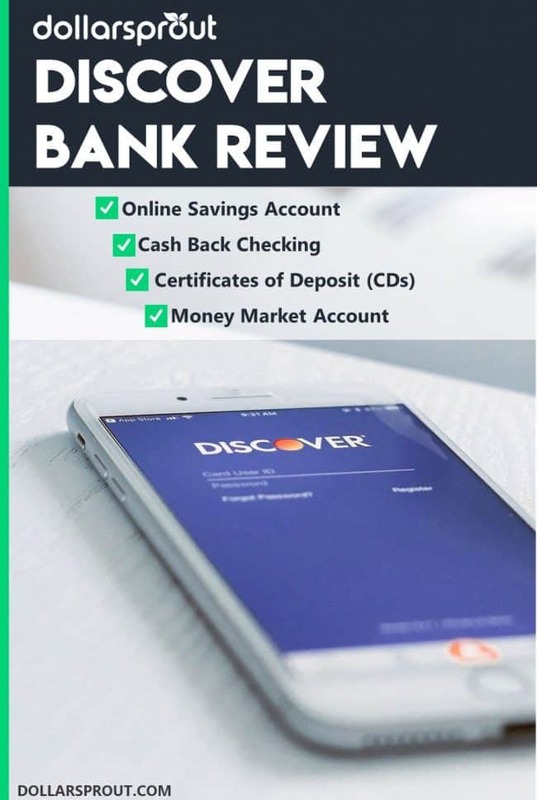 In this Discover Bank review, I’ll discuss four of their main banking products, and share what I think about each one. Discover Bank holds an A+ rating with the Better Business Bureau (BBB) with 58 years of continuous business served. Discover’s savings account was named one of NerdWallet’s best savings account for 2018, and it’s easy to see why. Discover stays ahead of other companies with their lack of fees and high APY (annual percentage yield). It’s important to have a good understanding of how APY works if you don’t already. Discover has one of the highest APYs in the online banking world, which is a huge perk. Brick and mortar banks typically give about 0.01% to 0.05% APY, but with the low overhead of an online bank, those savings get passed onto the consumer. Interest rates fluctuate regularly, so it’s best to check Discover’s website for the most up to date figure. To me, not having to pay for the privilege of storing my money is even more important than the interest rate. We’ve all had a financial emergency at one time or another. Whether it’s a significant car repair, an unexpected medical expense, a tuition hike, or an irresistible pair of Jimmy Choo’s, a temporary dip in the bank account is normal. What’s not normal is being punished for it. As the saying goes, life isn’t fair, but I still think maintenance fees and requirements for a minimum balance stink. This is another reason that I love Discover Bank. No monthly maintenance fee or minimum deposit makes it easy for anyone to open and maintain an account. If you have a large amount of money you want to deposit in a Discover Bank savings account, their savings account bonus puts them ahead of most other options. Although Discover does not have a minimum you must deposit for opening a savings account, you do have a minimum you must deposit in order to get the Discover savings account bonus. This offer varies, so check out Discover’s online savings account for current bonus opportunities. One of the significant tradeoffs of Internet banking is not having access to an ATM since there are no physical branches. 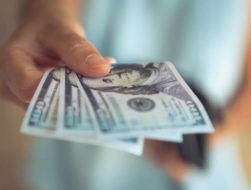 Discover technically has one branch in Delaware, and that happens to be the only place you can deposit cash into your account. So, unless you happen to live near that office, you won’t be able to put cash directly into your account. Because there are no Discover Bank locations outside of the one in Deleware, you’ll be limited to check deposits or wire transfers only. If you run a cash-based business, this may be a deal breaker for you. However, you still have access to 415,000 ATMs. Watch out for fees, though. The average transaction fee is $2.77, and only 60,000 of the ATMs in Discover’s network waive the fee. There’s also a limit of six withdrawals per month, but that’s universal across all online savings accounts, not just Discover’s. If you exceed the withdrawal frequency, you’ll have to pay for each incident over the limit. There’s another way to get cash back without paying for it. If you open a checking account and get a debit card, you’ll get cash back with no transaction fees on some purchases. As of May 7th, 2018, online savings accounts, checking accounts, and money market accounts all come with something called First Fee Forgiveness. This means that once a year (starting on January 1st and ending December 31st), you’ll get one fee waived, and the amount will be credited back to your account. It’s kind of like an accident forgiveness plan for car insurance, but without the banged-up vehicle and potential injuries. What I love about this new feature is that it allows me to make a mistake each year without feeling stressed or kicking myself for being forgetful or absentminded. Yes, there may be a time that I hit the ATM a seventh time in one month to withdraw 20 dollars to buy something completely random. Having to pay a $15 fee for the excess withdrawal would definitely dampen my mood for a few days. The First Fee Forgiveness Program puts a smile on my face and makes me want to stick with Discover that much more. To sum up: If you’re actively trying to save money, then Discover Bank is the clear winner for a high-interest online savings account. You get some of the highest interest rates around, and you never have to worry about paying fees to store your cash. Checking accounts with consumer-friendly policies are even harder to come by than savings accounts. This is because banks know that checking accounts are likely to have lower balances and more activity than a savings account. You’re paying bills from this account and potentially using a debit card. All that activity can be expensive to track. I think many of us like to take advantage of ways to make money fast. With cash back bonuses, you’re not going to get rich. However, only a handful of banks offer rewards on debit card purchases, so this makes Discover stand out. Again, if it’s the end of the month and my balance is low until my next paycheck gets deposited, I don’t have to pay a “maintenance” fee. There’s no denying that having a checking account is a convenience, so it’s refreshing not to have to pay for the privilege. Also known as cashier’s checks. At my last greedy bank, I had to pay $8. It’s not something you need every day, but it seems insane to charge that much. If you’ve ever cashed someone else’s check and had it bounce, you might have been charged $15 to $35 for something that you have no control over and isn’t your fault. If you’re on a tight budget, that could also lead to an overdraft, which is another fee. That’s why I appreciate Discover because there’s no fee for someone else’s check bouncing. If you need to stop payment on a check, it’s about half the cost of other banks. And while the insufficient funds’ fee is $30, you’ll only be charged a maximum of one time per day, versus other banks who can ding you up to four times in a business day. Have you ever opened a checking account in person? It’s a long process that feels like a mix of an invasive doctor’s appointment and a trip to the DMV. There’s a lot of paperwork, questions to answer and tons of waiting. And whenever I’m sitting in a bank, I begin second guessing every single one of my financial decisions. When you open a Discover Cashback Checking Account online, there’s no judgment about how much you plan to fund your account with. It’s three easy (and painless) steps. Other online banking apps have been a nightmare to use. One app crashed every time I tried to deposit a check. And, more often than not, it would tell me that it couldn’t read the sum I deposited, even though it was typed out and not scrawled in illegible ink. The Discover Banking app has a 4.8 rating and a whopping 1.66 million reviews. To say it works like it’s supposed to is an understatement. It is expected that the Discover Bank app will remain excellent and up-to-date since there is only one Discover Bank location. Most transactions are meant to be completed online or on your smartphone and therefore the company relies on a top quality banking app. To sum up: Unless you’re in a situation with your checking account physically handcuffed to other assets that make closing it down impossible, I highly recommend using Discover for your checking and debit card needs. If you know you won’t need to touch your money for a while, a CD is a safe way to collect a higher interest rate than a bank account. I love CDs because when I have extra cash, I can put it to work with zero risks because the funds are FDIC-insured. Let’s say I have a summer European vacation planned next year, and I’d like to have an extra $1,000 on hand to take along. I can use Discover’s online calculator to figure out exactly how much money I’d have to set aside, and how long it would take to reach my goal. What’s most useful about Discover’s CDs is that I don’t even have to plan far in advance to benefit. For example, you already know that a bank account can pay over 1.5% interest. But keeping that same amount secure in a CD for just 12 months, I can earn a higher rate. It’s like having free money, and there’s virtually no risk. To sum up: If you have even a little bit of extra cash that you know you don’t need immediately, a CD is a no-brainer. If only I had discovered these financial instruments sooner… Like when I was five. 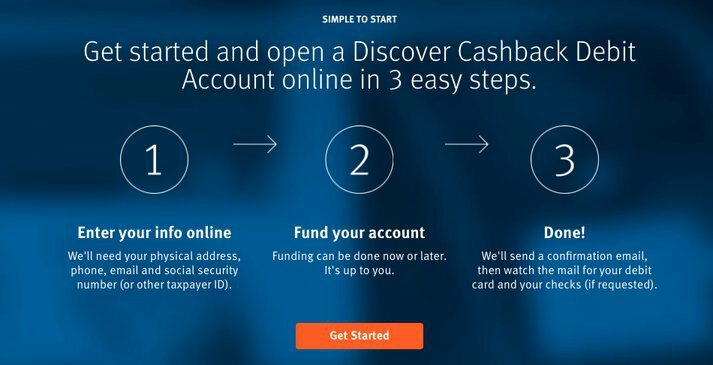 Like the checking account, you can also open a Discover CD online in three easy steps. First, it pays higher interest rates. Second, it requires a higher minimum deposit to open. Lastly, it requires a high minimum balance, or you incur monthly fees. With Discover, the minimum opening amount is $2,500, and you must maintain that balance, or you’ll pay a fee. You do get a three-month grace in case you have a temporary cash emergency, which is helpful. Here’s where things get a bit odd, though. There are two listed APYs for money market accounts (one for balances under $100k and one for balances over $100k), but both rates are less than the regular online savings account. I found there’s no discernible difference other than the money market account being more restrictive and paying less interest, which means there may be better options out there if you are specifically looking for a money market account. Overall, my Discover Bank review is positive. They offer competitively low rates, no or low fees, a fantastic app, and easy access to your funds. Discover Bank customer service is top-notch and they are backed by the FDIC. There are some cons (like anything in life), but these certainly do not outweigh the benefits. The rates are competitive. You’ll get more interest and more cash back than just about anywhere else. No and low fees. No maintenance fees, no minimums and low fees for routine services make Discover a top choice for anyone’s banking needs. Easy access to your money. With nearly half a million ATMs, you’ll be able to get cash almost anywhere. An out-of-this-world app. Thankfully, apps, in general, have gotten better over the years, but several in the banking industry still need improvements. The Discover Mobile app is indisputably first class. The new First Fee Forgiveness Program. It encourages customer loyalty, and it’s the right thing to do to maintain goodwill. Discover Bank customer service. The company employs a U.S.-based customer service team. If you’ve tried discussing anything complicated or had to repeat a string of 16 digits over and over again because of bad phone connections, delays, or a poorly trained staff, you know how frustrating that can be. There is only one Discover bank location. If you do need to do any in-person banking, you may decide to go with another institution. The possibility of extra fees. While this hasn’t happened to me, there are some reports of people saying Discover charges extra fees for financial transfers. If you’re doing this type of transaction, make sure you keep a close eye on your accounts online. Call the bank immediately if you notice any suspicious or double charges. In this Dosh Review, we’re going to show you the details of how Dosh works, how it compares to other cash back apps, and whether downloading Dosh is the best choice for you.